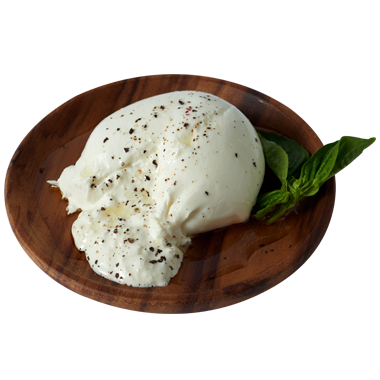 Burrata bursts with cream and fresh strands of mozzarella when you slice into it. Its meaty interior is as fresh as a cold, straight-from-the-farm glass of milk. We like to think of burrata as mozzarella with a special surprise inside! It’s one of the world’s most perishable cheeses, so it’s not exactly the best to import. That’s why we decided to take our farm-fresh cow’s milk and craft it for you in Wisconsin, situated as we are in the middle of everything. If you get your hands on a ball of this straightforward, honest Wisconsin-Italian burrata, well, you’re living your life the right way. In southern Italy, where burrata was born, it is often eaten on the morning that it’s made. In other words, burrata is always best when most fresh and we recommend eating it within two days of purchase. We like it at room temperature or slightly cooler. Burrata is a very delicate cheese so limit your handling of it. We recommend that you remove the seal, drain the water, and then portion the cheese while still in the package to contain the inner cream you’re about to unleash. Our favorite wines to drink with burrata are light-bodied Italian reds and zippy whites such as sangiovese, montepulciano, valpolicella, verdicchio and sauvignon blanc. Light beer and hard cider play well with burrata too. We like to enjoy fresh burrata with simple and scrumptious in-season foods like olive oil-sautéed veggies (particularly eggplant! ), lemony pea or fava salads, ripe and juicy late-summer peaches and thick-sliced heirloom tomatoes drizzled in olive oil and seasoned with salt and pepper. We don’t really cook with it, since it’s so fresh and delicate, unless we throw it on a pizza right before it’s done baking.